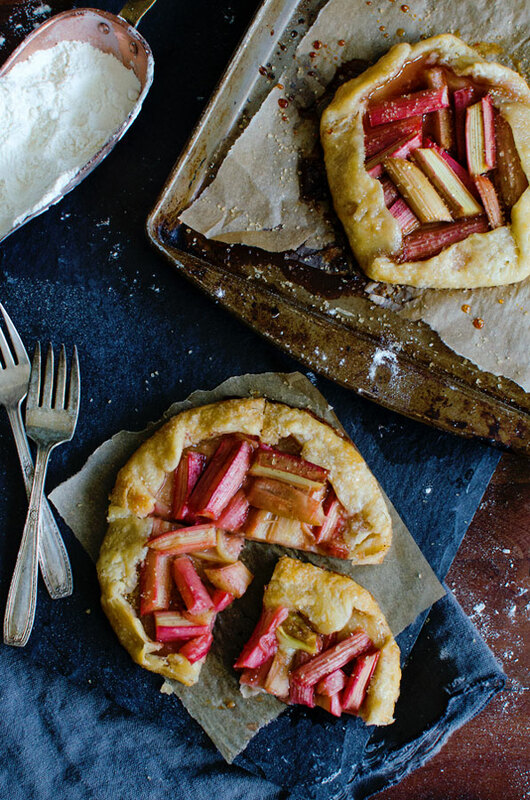 A recipe for gorgeous rustic rhubarb galettes. They are easy to make and perfect for dessert or brunch! In mini form, they are the perfect spring recipe. 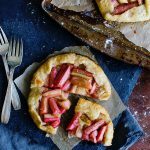 I shared this gorgeous rhubarb galette recipe a year ago on the Edible Magazine blog. Now that Spring is here again, and rhubarb has reappeared at local farmer’s markets I’ve been dreaming about making it all over again. Both tart and sweet, with a perfectly flaky crust it’s a dessert that is as appropriate for brunch as it is after dinner. My standard galette spiel: they are so much easier to make than pies and much more forgiving! Their haphazard look is part of their charm. Are you drinking the galette kool-aid too? Here are some more galette recipes I’ve created over the years. For more Sweet in your life, you can find me on Instagram, Pinterest, Facebook, YouTube, Bloglovin’, Snapchat (@asideofsweet), or Twitter. You can also subscribe to receive a weekly email with new posts and random musings from me. 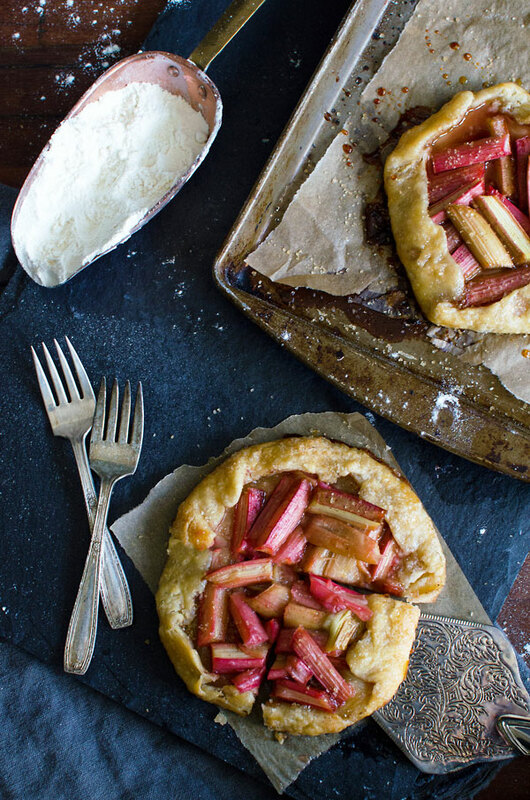 A recipe for gorgeous rustic rhubarb galettes. They are easy to make and perfect for dessert or brunch! In mini form, they are the perfect spring recipe. Makes four six-inch galettes. Combine the flour, sugar, and salt in a large bowl. Cut in the butter until the largest pieces are pea-sized, or use a food processor and pulse a few times until combined. Don’t over mix or the dough will get tough. Sprinkle ice water over the flour mixture one tablespoon at a time and stir with a fork to combine until it starts to come together. Gather into a ball with your hands. Divide the dough into four equal balls and flatten with the heel of your hand. Wrap in plastic wrap and refrigerate for a least an hour, up to overnight. Cut off the ends of the stalks of rhubarb and slice each stalk in half lengthwise. Cut into 1 1/2 inch pieces. Mix the rhubarb, sugar, lemon juice, cinnamon, cornstarch and vanilla in a large bowl. Let macerate for at least 30 minutes. Place a section of galette dough on a floured surface and roll into an 8-inch round. Transfer to a parchment paper-lined baking sheet. Spoon 1/4 of the rhubarb mixture on the center of the rolled out dough, leaving an inch border on each side. 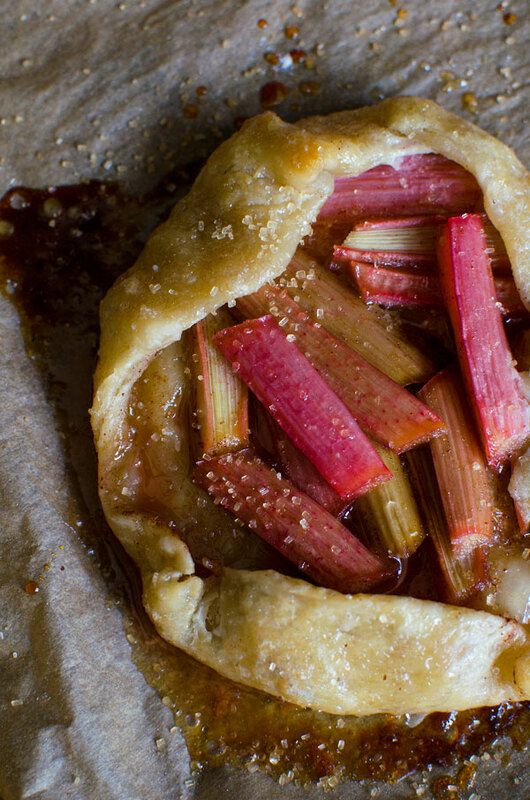 Fold the uncovered dough over the rhubarb in an overlapping fashion, leaving some of the center fruit exposed. The nice thing about galettes is that it doesn’t have to be perfect! Repeat steps with each dough round. Brush the crust with buttermilk or heavy cream and sprinkle with raw sugar. Drizzle rhubarb with honey. Bake at 350? Fahrenheit for 30-35 minutes, or until crust is golden brown. Serve warm or at room temperature.